Please note: www.BeginnersCobitCompanion.com now redirects to this page. Other publications by the author of The STREAM TONE: The Future of Personal Computing? Beginner's COBIT Companion provides a gentle introduction to COBIT 4.1, the IT Governance framework from ISACA; it contains a wealth of useful information for any reader new to the subject.The principle chapters are short, and to-the-point, providing just enough information to quickly give the reader an understanding of the fundamentals of COBIT 4.1; in fact, most readers should be pleasantly surprised at just how quickly they can get up-to-speed on COBIT 4.1 using this book. The appendices, which make up a large part of this book, contain the extra details that might be needed later, once the basics have been mastered, to progress to the next level. A revision guide for the COBIT 4.1 Foundation Examination has also been included, along with two, forty-question, mock exams. The inclusion of extensive extracts from the original COBIT 4.1 manual, licensed from ISACA/ITGI, ensures that the reader can start to familiarise themselves with the concepts, terminology, and phraseology found in the official COBIT 4.1 literature. Passing the COBIT 4.1 Foundation Examination is not difficult; but you do need to know the basics of COBIT 4.1 well, in order to do so. 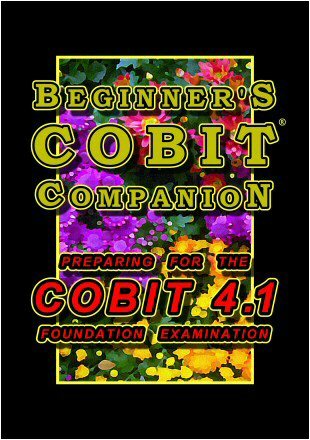 Beginner’s COBIT Companion: Preparing for the COBIT 4.1 Foundation Examination can help you to learn the basics of COBIT 4.1. It contains extensive extracts from the original COBIT 4.1 manual, reproduced under license from ISACA/ITGI, as well as three, forty-question, mock exams to help you gauge your probable readiness to sit the COBIT 4.1 Foundation Examination. Beginner’s COBIT Companion: Preparing for the COBIT 4.1 Foundation Examination is designed to help you get up to speed on COBIT 4.1 quickly, and focuses specifically on those aspects of COBIT 4.1 that you will need to know in order to pass the exam. For example, COBIT 4.1 contains thirty-four processes but only only two are tested in detail by the exam, therefore, whilst all the processes are mentioned, only COBIT processes PO10 and DS2 are presented in full detail in this book. COBIT 1 was published in 1996 and was originally focused on auditing. COBIT 2 was published in 1998 and was focused on control. 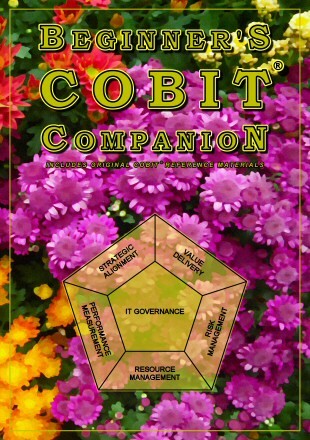 COBIT 3 was published in 2000 and was focused on management. COBIT 4 was published in 2005 and was focused on IT governance. COBIT 4.1 was published in 2007 and remained focused on IT governance. COBIT 5 was published on 10th April 2012 and represents the most significant change in the framework to date, as it integrates COBIT 4.1, Val IT 2.0, Risk IT, Business Model for Information Security (BMIS), IT Assurance Framework (ITAF), and other best practice materials, into a new super-framework; a business framework for the governance and management of enterprise IT. Before the release of COBIT 5, COBIT was an acronym, that stood for Control OBjectives for Information and related Technology. However, with the launch of COBIT 5, which is no longer just about control objectives for information and related technology, COBIT is no longer an acronym it is simply the name of the new framework. COBIT 4.1, and the other frameworks that were integrated into COBIT 5, also have their own substantial support materials available for immediate use and which are generally available free of charge from the ISACA web site. Enquiries relating to the above books can be made via the Contact page. Website design by T. Gilling. Disclaimer: The author of this web site accepts no liability whatsoever for any loss that may arise from the use of information contained herein. ® COBIT is a Registered Trade Mark of ISACA and ITGI. © Copyright 2014-2018 T. Gilling. All rights reserved.